Wash and dry the bell pepper. If you have a gas stove, grab the pepper with some tongs and place it directly on an open flame. Turn the tongs frequently until the pepper is charred on all sides. Place it in a bowl and cover it tightly with some plastic wrap. The peppers will sweat as they cool down. Let them cool for about 15 minutes. Remove the stems and seeds and peel them. Cut the peppers into strips and drizzle with olive oil. Do not discard the rendered juice. If you do not have a gas stove, turn on the broiler in your oven. 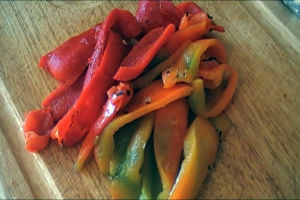 Place the peppers on a baking sheet and lightly brush them with some olive oil. Place the pan directly under the broiler. Be very vigilant and turn them as they char. Be careful not to burn them. Remove them from the oven and place them in bowl. Follow the same instructions as above.